Anne-Marie dreamed of a bigger home. For more than 35 years, sunrooms built by TEMO have changed the way families across the country live. There’s something about getting closer to the beauty and peace of nature that inspires us to slow down, relax, and cherish life’s moments with those we love, every day. 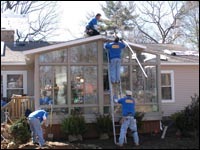 This past March, TEMO Sunrooms proudly donated a sunroom to the Vitale family in St. James, New York, as part of their extreme home makeover for ABC’s hit reality show “Extreme Makeover: Home Edition.” The episode aired May 15, 2005. Everyone helps unload the newly arrived sunroom. 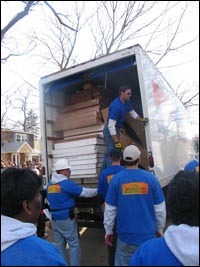 “Extreme Makeover: Home Edition,” (which airs Sundays, 8:00 p.m. ET), answers the call of families in desperate need of help. The Vitales were one such family. 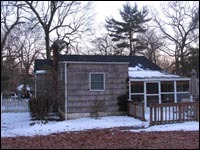 In 2004, John Vitale, a Suffolk county police officer, his wife Anne-Marie and their three young sons had outgrown their tiny two-bedroom home. They decided to expand it and moved in with Anne-Marie’s parents. But soon after, Anne-Marie was diagnosed with an aggressive form of leukemia and died August 3, 2004. She was buried on what would have been her 29th birthday. First, a thermal deck floor. John dreamed of returning to the home where he and Anne-Marie had hoped to raise their children but renovation was impossible. The medical and funeral bills from Anne-Marie’s illness drained the family’s savings and John’s life was consumed with working full time and raising three toddlers as a single parent. “Extreme Makeover: Home Edition” wanted Anne-Marie’s babies to live out the childhood she wanted them to have. They called on an authorized dealer of sunrooms manufactured by TEMO who handled the entire renovation of the Vitale home, including installing the beautiful 14’ x 16’ sunroom donated by TEMO. Fast installation with precision panel roof and wall systems. Race Hemby, and TEMO’s Construction Manager Bruce Gilfillan traveled from Clinton Township, Michigan, TEMO’s manufacturing and corporate headquarters, to spend a week in New York for the makeover. 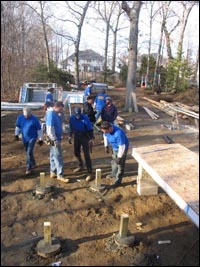 Hemby and Gilfillan were part of the teams of builders who worked around the clock in 40-degree March temperatures. The entire home was renovated in less than a week. Making dreams a reality has been TEMO’s specialty since we entered the business as the innovator and nationally recognized manufacturer of all-thermal sunrooms more than three decades ago. A beautiful sunroom for Anne-Marie’s family. Sunrooms by TEMO provide more space for growing families and important protection from overexposure to the sun and biting insects. Wrap around windows usher in light and nature creating an open, healthy and inviting environment for simply relaxing, or playing, or celebrating life’s little moments every day. TEMO wishes the Vitale family a lifetime of happiness in their new sunroom and their new home. And we invite you to explore the many ways a sunroom can make your family’s dreams a reality, too. 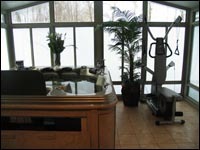 Learn more about sunrooms built by TEMO. We invite you to visit the rest of our site. Discover the full line of styles that can be customized to your family’s needs, your home’s architecture and your budget. Order your free and informative Sunroom Planning Guide. You’ll be surprised to learn how quickly and affordably your family can start sunroom living. Or contact your local dealer today to arrange your free, no-obligation in-home design consultation.